Tilapia is a beautiful thing. And it can be turned into many beautiful things. And what makes it even more beautiful is that it takes just minutes to make. Place flour on a plate and season with salt and pepper. Beat egg with 2 tablespoons of water in a bowl. Gently place tilapia on plate and coat lightly with flour on both sides. Place in egg wash, then back in flour. Add butter and oil to hot skillet over medium heat. Place tilapia in pan and cook for about 2-3 minutes on each side. Add lemon juice and wine and cook for another 5-7 minutes. If sauce gets too thick add a tiny bit of water. Add salt and pepper to taste. Top with lemon slices and chopped parsley. This is a delicious take on tilapia, Melissa! Looks so decadent and delicious, while also being pretty darn nutritious. Thanks for sharing! This looks yummy! I love lemon, wine and fish. A classic combination. That's a whole lotta beauty in one fish! I love all things francese...lemony delicious. 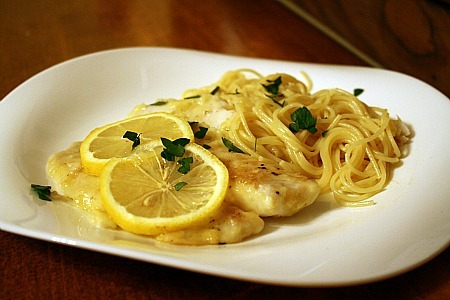 Looks yummy and fast to make, will have to keep it in mind for those nights I don't have much time to cook!